Contain Markings for:1. P-39N of 9 GIAP, August 1943. Personal aircraft of Kpt. Sultan Achmet - Chan. 2. P-39N of 16 GIAP, Germany, April 1945. Personal aircraft of Lt. Konstantin Suchow. 3. 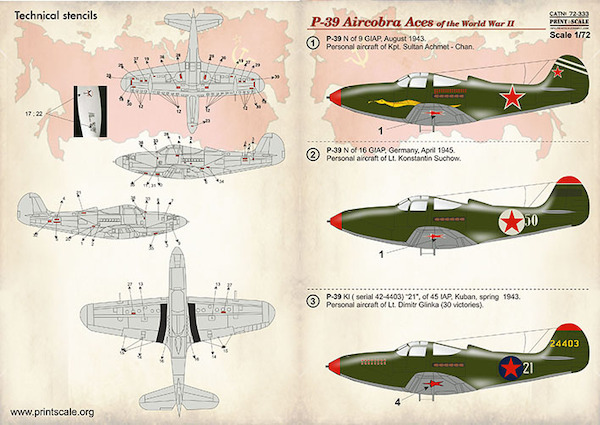 P-39Kl ( serial 42-4403) "21", of 45 IAP, Kuban, spring 1943. Personal aircraft of Lt. Dimitr Glinka (30 victories). 4. Airacobra l AH 636 White 33 of Capt Ivan Dmitrievich Gaidaenko, 19 GIAP, Autumn 1942. 5. P-39D-2 41-38428 White 37 of Capt Vadim Ivanovich Fadeev, 16 GIAP, April 1943. 6. P-400 "77" of 6 IAE VMF SF, winter 1942/43. Personal aircraft of Yuri Penakov. Aircraft in temporary white camouflage with Medium Grey undersurfaces. 7. P-400 "60" of 2 GSAP winter 1942/43. Aircraft silver overall. 8. P-39N-1 42-9434 White 45 of Capt Aleksandr Fyodorovich Klubov 16 GIAP, Poland, October 1944. 9. P-39N Silver 24 (serial and pilot unknown), 191 IAP, Leningrad Front, Summer 1944. 10. P-39Q-25 44-32286 White 77 of Sr Lt Nikolai Vasil'evich Stroikov, 213 GIAP, Poland, September 1944. 11. P-39Q " White 10" of Capt Pavel Stepanovich Kutakhov, 19 GIAP, Shongui, late 1943.